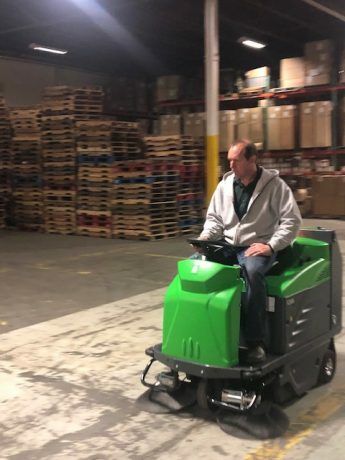 A couple of warehouse facilities in the Northeast region got to see first-hand how well the 1280 sweeper rider can improve cleaning processes and increase productivity. The rider sweeper has a long battery run-time, of up to 4 hours, and can clean 68,000 square feet in just one hour. It has high dump capabilities for emptying the hopper, making work minimal for the operator. The machine features IPC Eagle’s Self Leveling System innovation, in which the sweeper can automatically adjust to any surface being cleaned. To schedule a demonstration for IPC Eagle’s sweepers, click here to have somebody contact you.